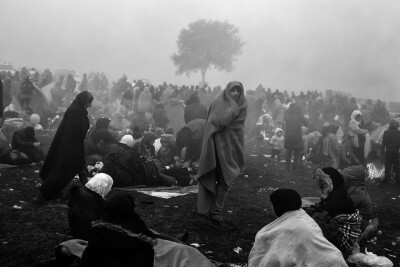 Individual exhibition of Slovenian documentary photographer Jaka Gasar taking place at ZRC Atrium will showcase his recent works from 2015 when the photographer was covering and documenting so called refugee crisis in Slovenia. Where have you come from? Where are you going? Did you feel fine at home? Can you still dream? Who do you love? Where are your friends? Parents? Brothers, sisters? Children? What is your name actually? There are times when questions are unnecessary: all of them. Whether personal, global, superficial or those concerning our very reality… More of them. They (who are “they”, is he referring to “questions” or to the “refugees”) are indecent. Tired legs, wounded feet, weather-beaten skin, dirty nails all suggest that the answers got lost en route. Worn-out shoes, torn sandals, broken crutches, all speak of the strong will of the refugees, and of their heroism, for they were capable of setting off on this immense journey while surely being aware of the horrors and perils that awaited them along the way, perhaps even having a had a premonition of the dehumanisation awaiting them at the end. Slovenia is a way station for refugees. Not too kind, yet moral enough to let them rest for a moment. It offers them water, food, clothes, medical care. A provisional bed. Shoes. Then they move along, continuing their long journey. The exhibition is open until 17 June 2016.